In a surprising move on Tuesday, second-largest U.S. wireless carrier AT&T quietly activated Apple's FaceTime over cellular for all subscribers, including grandfathered-in unlimited data users. 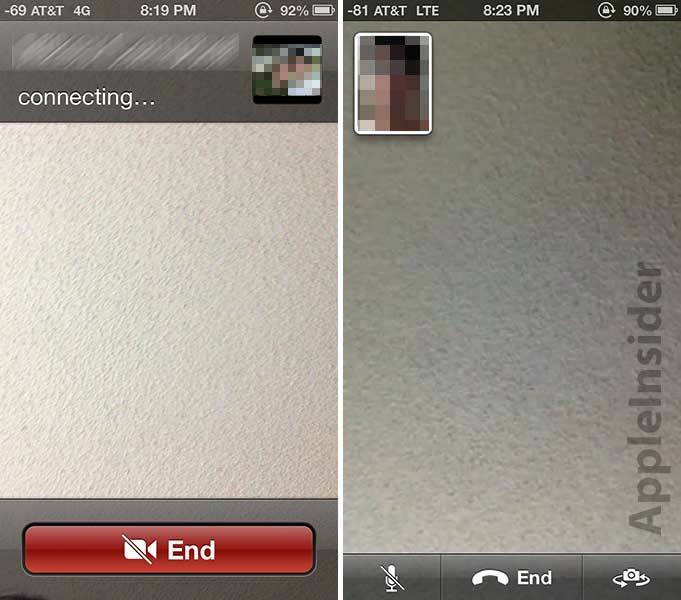 FaceTime as seen on an iPhone 5 connected to AT&T's cellular 4G HSPA+ (left) and LTE (right) networks. It appears that AT&T has made good on its promise to flip the switch on FaceTime over cellular for customers without a Mobile Share data plan, though the company also added in existing users who have carried over unlimited plans since the all-you-can-eat option was abolished in 2010. Because the carrier has yet to make an announcement regarding its policy modification, the change may not yet be official, AppleInsider has reached out to AT&T and will report when a response is given. For now, the system does work as a few first-hand tests proved iPhones are able to make video calls over both 4G HSPA+ and LTE networks to other devices connected to either cellular or Wi-Fi networks. Users may need to restart their handsets before the feature becomes available. First reported by MacRumors, the option is apparently working on iPhone 4S and iPhone 5 units. AT&T first announced that it would be limiting over-the-air FaceTime service to Mobile Share subscribers only, but recanted earlier in November after customers protested the decision. For its part, the telecom believed that its initial plan was lawful and complied with Federal Communications Commission regulations that prohibit carriers from blocking services that compete with their own. Apple introduced FaceTime over 3G cellular with the iPhone 4S and expanded the feature to include subscribers of 4G networks with the iPhone 5. Of the top three U.S. carriers, only AT&T decided to impose limitations on certain iPhone users, while Verizon and Sprint offered the feature over their respective 4G networks when iOS 6 was launched in September.